The building, situated at the entrance to Loughborough University, houses various sports governing bodies and provide office space, break-out areas and sports equipment storage space. The scheme comprises four units up to 5 storeys high, linked through glazed circulation spaces, and covering a total area of 5900m2. 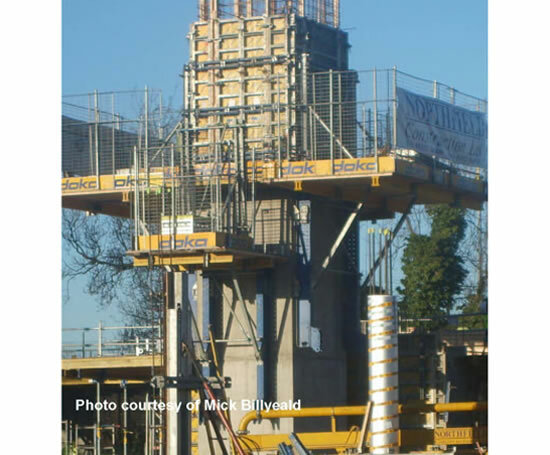 The process of constructing the central core and some of the walls involves waiting for concrete to achieve enough strength for formwork to be struck and repositioned. This typically takes two to three days, but seasonal weather was slowing the process and a solution was required to maintain usual build rate. Lafarge suggested its Chronolia™ 2+2 concrete, which gains strength rapidly, and can support itself after just two hours. 22m3 was supplied from Lockington over a three-week period. After two hours, the formwork was mechanically ratcheted back to reveal a concrete face that was cured sufficiently to hold its own weight and form. Test cubes were taken and crushed after 24 hours to ensure that the correct strength had been achieved. The 24-hour cube result was in the region of 36N/mm.